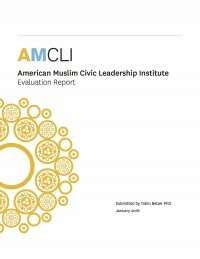 Founded in 2006 and launched programming in 2008, the American Muslim Civic Leadership Institute (AMCLI) works to transform the Muslim communal landscape in the United States by empowering the next generation of American Muslim civic leaders. AMCLI is a national and regionally based fellowship for young Muslim leaders (generally between the ages of 25-45) that provides participants with leadership development training, strategic guidance and networking opportunities. To date, 221 individuals have participated in AMCLI: 108 took part in five cohorts of the National Fellowship, which was implemented between 2008-2013. Another 113 have participated in five cohorts of the Regional Fellowship, which included gatherings in the Midwest, West Coast (2), South and East Coast. This evaluation was designed to investigate and articulate program outcomes and to obtain a more nuanced understanding of the various impacts directly from alumni. This evaluation has clearly shown the powerful and diverse ways that participating in AMCLI has affected alumni’s professional and personal lives. As many as eight years later, alumni continue to benefit from participating in the Fellowship. The experience was positive for almost every respondent, inspiring for most, and life changing for some. The response rate of 62% exceeds the 50% benchmark recommended for applied research. The strong representation across cohorts contributes to the probability that the sample is representative of the larger AMCLI population. The robust trends that emerged throughout the data further add to the level of confidence that can be placed in the results. Quotes throughout the report were selected (from both interviews and open-ended survey questions), because they are illustrative of sentiments articulated by several respondents.